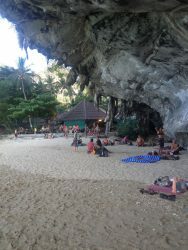 Another great place in Thailand whether to relax or spend the whole day doing tours. 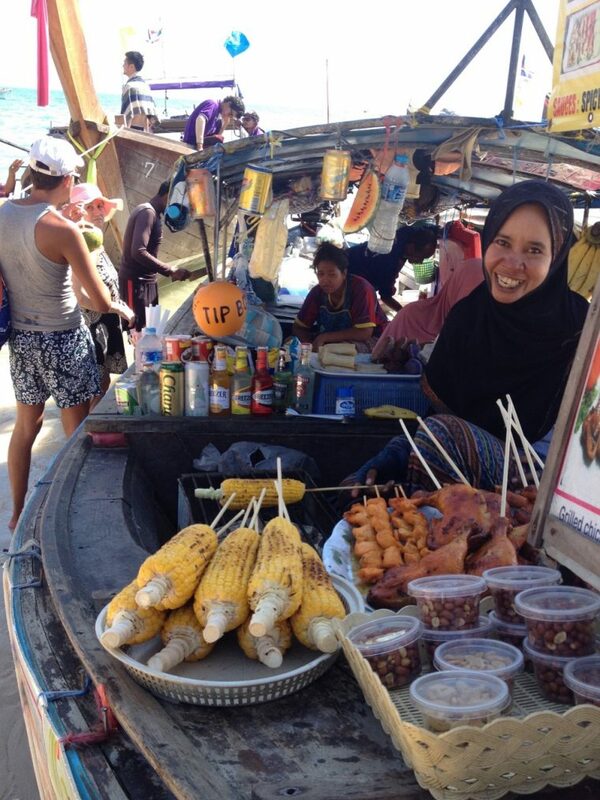 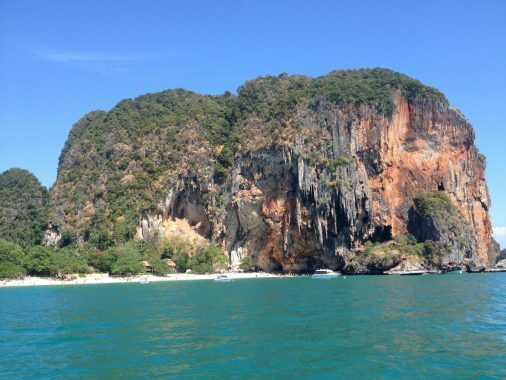 Railay is isolated from the mainland and the only way to get there is by boat. 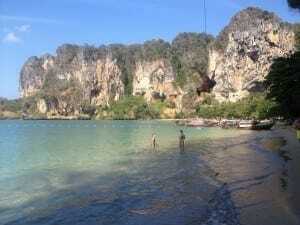 There is two side of Railay: East and West. 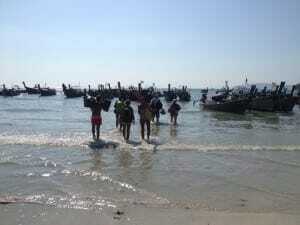 I stayed on the West side which is calmer and more undeveloped than the other one. 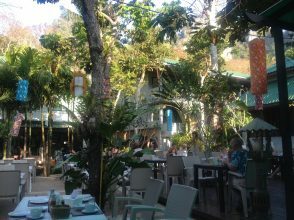 The streets are not pavemented and dark, but totally safe. 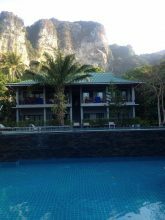 My hotel in Railay Beach West. 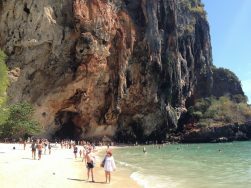 Another option is to stay in Krabi and spend the day in Railay. 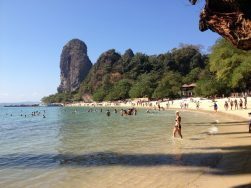 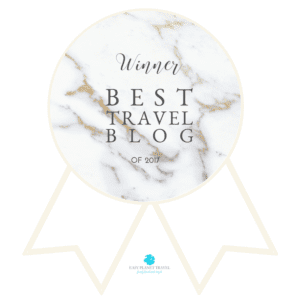 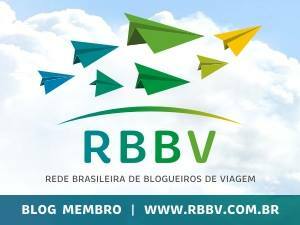 Check here: Where to Stay in Krabi as a first time visitor. 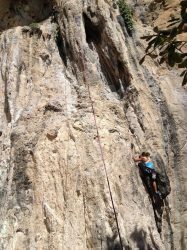 Rock climbing: this beach is very well-know for rock-climbing and has some cliffs and attracts beginners and experts. 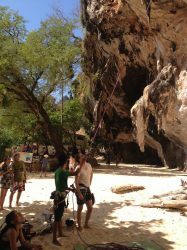 Rock climbers in Railay Beach. 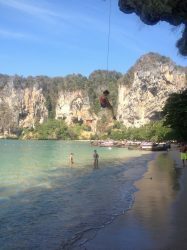 Rock climbing in Railay Beach. 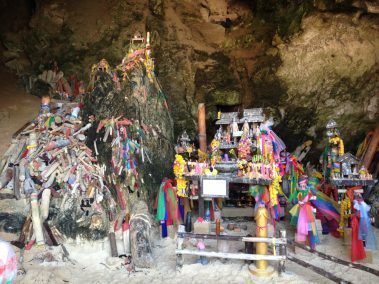 Phra Bang Shrine: this shrine located on a cave according to a legend is dedicated to the spirit of a drowned princess who gave the beach her name and attracts curious from all over the world. 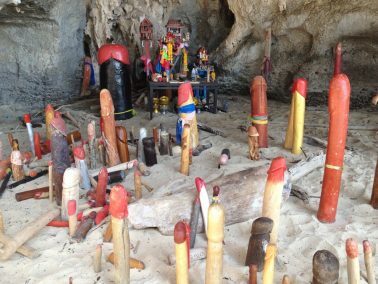 The phallic symbols are associated with fertility and virility and should be treated with respect once many fishermen and boatmen still make donations to ensure a safe journey. 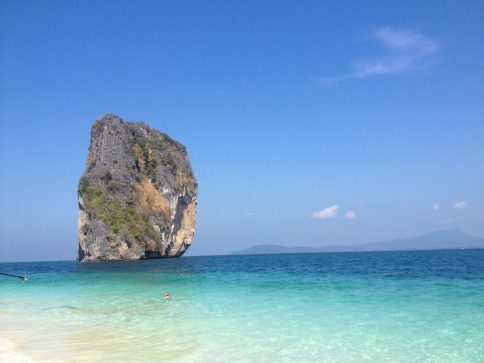 View Point: perfect for watching the sunset and get a bird-eye view of the bay. 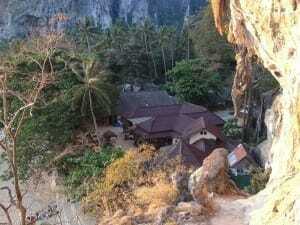 View point in Railay Beach West. 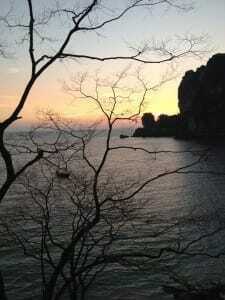 Sunset from the view point in Railay Beach West. 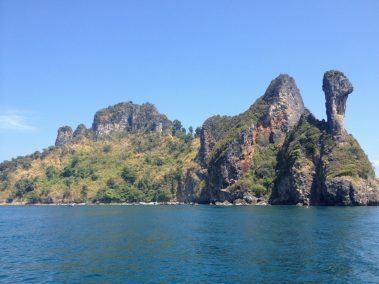 Chicken Island: great for snorkeling and famous for its “chicken” shape. 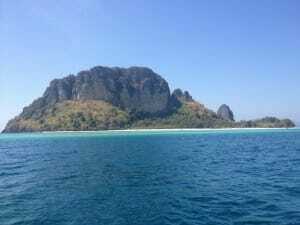 Great snorkeling in Chicken Island. 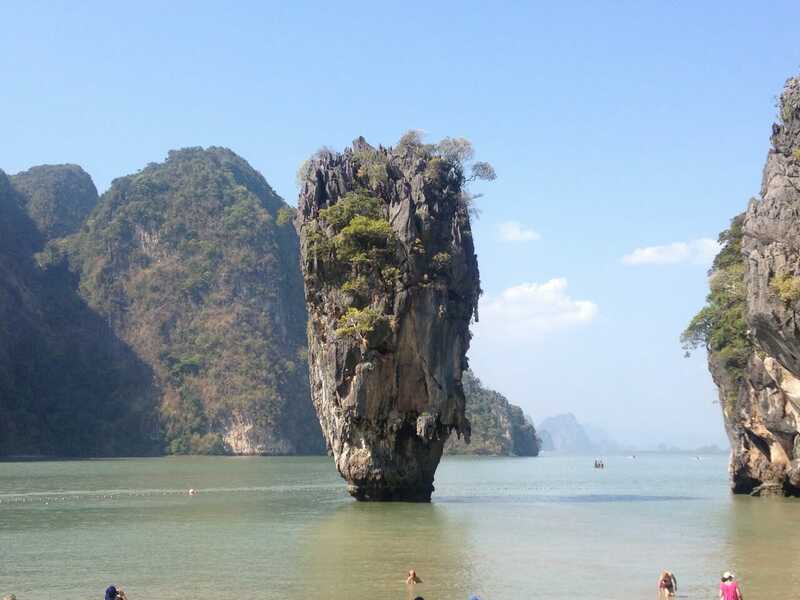 Poda Island: the crystal-clear turquoise water, powdery sand and this big rock shooting majestically from the water is from otherworldly. 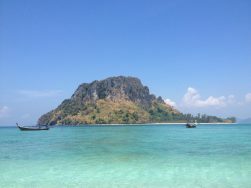 Tup Island: the islands connected by sandbank with crystal-clear water that you will not believe that is true… I was astonished!! 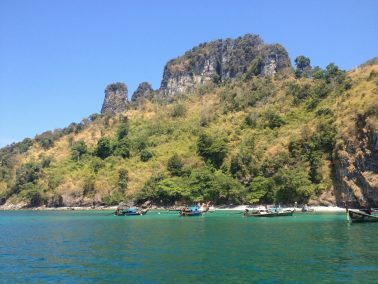 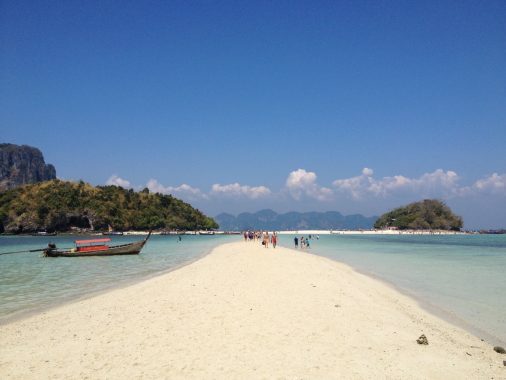 One of the most beautiful islands in Thailand, Tup Island. 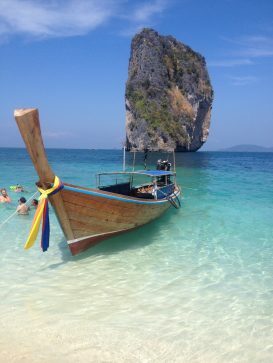 Crystal-clear water at Tup Island.